I have purchased an MG995 servo (4.8-7.2V operating voltage, 170MA no load operating current draw) and will power this using a 5V, 2A mains plug pack. Do I need a breadboard to connect this with my Arduino (which will itself be powered through its usb port)? Or is it possible to connect the servo with the Arduino directly? except the red wire (and black wire?) connects to the external power supply? Any answers (or links to relevant tutorials which have all three of these components) would be welcome. Thanks! Your question is not very concise, but I'll try to hit the main points. I'm going with the assumption that your "Arduino" is the Sparkfun Redboard. The Redboard has a current limit of <800mA (heat management on the Redboard probably lowers this number even more), as per the LM1117 voltage regulator listed in the provided RedBoard schematic, and a minimum input voltage of 7V. You won't be able to power your Arduino with the 5V2A powerbrick. If you are powering the RedBoard through the standard USB, then it will typically be limited to 500mA. Are you sure your servo has a no-load draw of 170mA? That's really high for a servo. If it does, then I'm assuming it's a large servo that likely has a high stall current draw, so 800mA from the Redboard's on-board regulator won't cut it, nor a USB port. To power your servo externally, wire the servo and Redboard according to the schematic below. The power supply is indicative of your 5V 2A "wall wart". 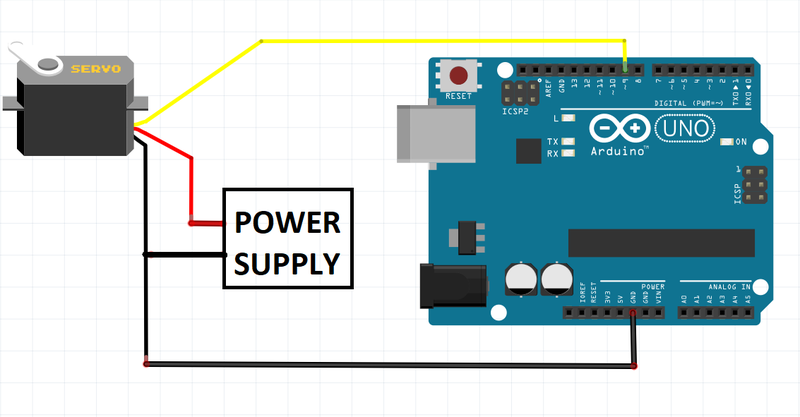 It's important to note that you need to connect the ground of the the power supply to the ground of the Arduino. For controlling the servo, check out Adafruit's servo tutorial. You will also need to provide power to your Arduino via USB or a DC barrel jack with a power brick that outputs >= 7v. You did not indicate how you plan to connect the 5V, 2A mains plug pack to the Arduino board. If you want to use the barrel jack on the left, please note the listed input voltage. 5 volts is too low if you plan on powering the Uno board with the external power source. There is a voltage comparator circuit that will switch over to the barrel jack power if the voltage is high enough. But since you are not really asking about powering the Uno, just the servo, then it gets interesting. 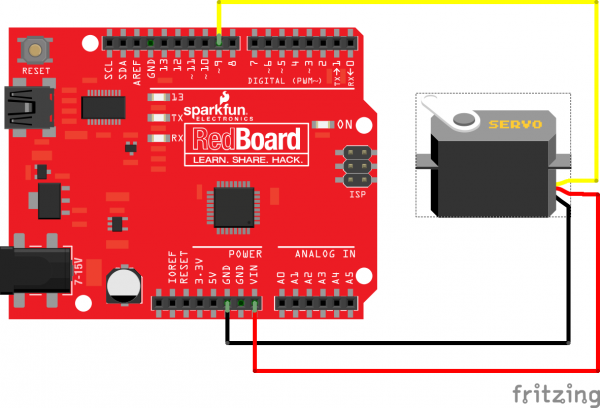 The Sparkfun schematic shows a diode in line with the barrel connector and the Vin connection point on the board. This could provide a power path for the servo. The problem is that the servo voltage range 4.8 volts on the low end. With a 5 volt output of your external power supply, a voltage drop from the diode would give the servo almost enough voltage to meet the 4.8 volt minimum but not quite. You are better off to not connect the servo power through the Uno board. If you had a somewhat higher voltage supply, at least 6 volts, then it would be ok. But if it is only 5 volts then it really is at a very marginal level. Not the answer you're looking for? Browse other questions tagged arduino-uno servo breadboard adapter or ask your own question.